The Pi is an old institution. While not quite as old as Apple or Microsoft, it is considerably older than the vast majority of computer companies and institutions in the world, and this became obvious on September 17, 2005. 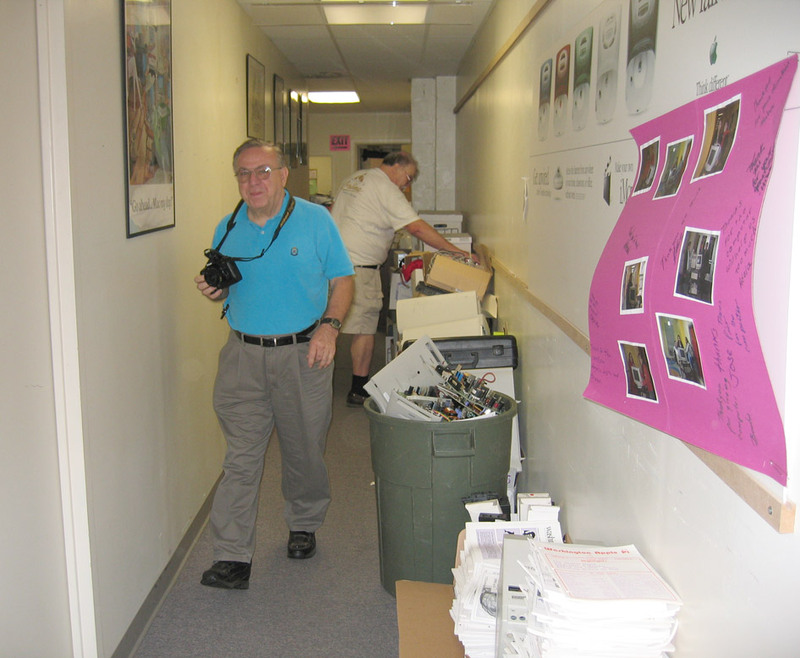 A team of volunteers from the Pi’s TCS Committee met at the Pi office to redo some network wiring – and ran, full tilt, into history. None of us could remember exactly when the Pi moved from Bethesda to Rockville (the misty tendrils of time are unclear, especially before lunch) but it was a world very different from today. The Pi’s bulletin board, the TCS, was based on dial-up modems and entirely text based using terminal programs. The host machines were Apple IIGS machines, each equipped with LocalTalk cards and the requisit LocalTalk cabling. LocalTalk was also used in the Pi office and tutorial rooms for printers and general networking. 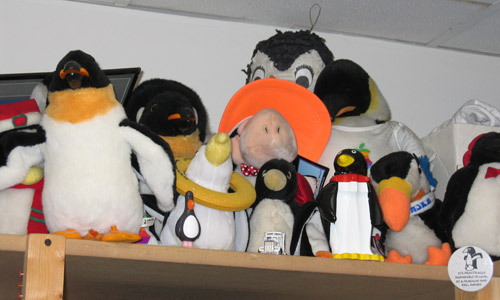 Networking equipment was scarce, and the layout of the Pi office space was daunting. Memories started flooding in as soon as some ceiling tiles were moved. Above the ceiling was a tangle of wiring: old telephone lines, old LocalTalk cables, and masses of cable that might be Ethernet or might not. After a few half-hearted attempts to sort it out, the work crew adjourned to a Chinese restaurant for regrouping and refueling. The original plan was to move some wiring around to accommodate reconfiguration of the Pi office space. The Pi’s landlord wanted to take back two rooms leased to the Pi, and we were to have them vacated by October 1. Accordingly, the TCS Crew had the very simple idea that the wiring would be pulled from these rooms and redistributed elsewhere. 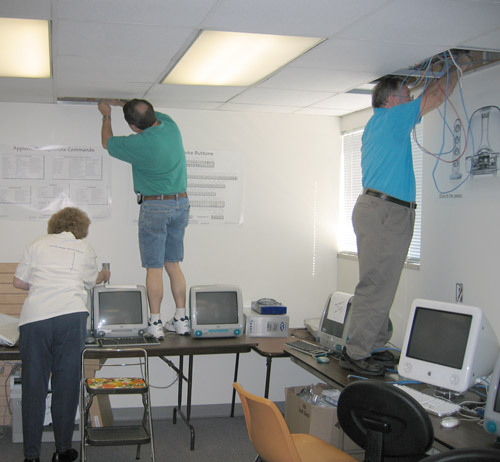 Meanwhile, other work crews were emptying the tutorial rooms of centuries (so it seemed) of accumulated computer paraphernalia, and the stacks of equipment blocked access to the walls from where wiring needed to be removed as well as walls where it needed to be installed. This we knew in advance. But we’d forgotten about history. Over the years, more and more wiring was added, and nothing was removed. The TCS had long ago retired all the Apple II machines; all telecommunications services are now provided over the Internet from Macintosh computers. Yet the old LocalTalk cables were still in the ceiling, along with PBX telephone cable, POTS (Plain Old Telephone Service) cable, and great masses of what might be Category 3, 4 and 5 Ethernet cable. There was also cabling from an old closed circuit TV system used by a prior tenant, old thermostat and alarm and intercom cables, and some stuff that we simply couldn’t identify. Some of the cabling was labeled. Some of the labels made sense. History played a role in the quantity of Ethernet cabling. When Ethernet networking was added in the 1990s, Ethernet hubs were the rage. With a hub, you had to run a full cable from every machine back to the hub so, if you had two dozen machines scattered around the office, you had to have two dozen cables pulled through the ceilings. We never did have two dozen machines connected at once, but we thought we might, so Ethernet cables gradually accumulated over time, hidden in the ceiling. In today’s world, where Ethernet switches are the rule, good design suggests you run a single cable to a given point, install a switch, and then attach machines to the switch. You can easily daisy-chain switches, which greatly cuts down on the amount of cabling required. But in the 1990s, Ethernet switches were prohibitively expensive, and daisy-chaining hubs is disastrous. 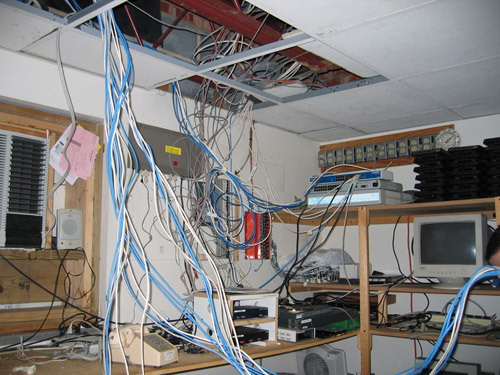 To cut down on the amount of rewiring, it was suggested that we leave just a couple cables running to the main meeting room and up to the front of the office, and install switches to then distribute network connectivity. We debated this for a while, and finally rejected it: we didn’t have that many working switches. This sad fact meant that everything had to be done twice: cables had to be pulled from the rooms that were being returned to the landlord, then pulled, again, into the rooms were connectivity was needed. Pulling cable without disrupting wiring that we wanted to keep, without electrocuting anyone, and without triggering fire equipment, is a delicate task. Fortunately, the drop ceiling tiles made access to the cables fairly easy. Unfortunately, a couple of brick and cement firewalls made getting from the front to the back of the office difficult. Fiberglass insulation also made life unpleasant. At one point, in order to push cable from one cramped area and into another, the Crew reenacted a Nordic myth, preparing a wooden spear for our figurative Odin who then cast it above the ceiling tiles to its destination. Many were the praises for this epic cast, and for the wonders of duct tape. The effort was suspended late in the day, with all the cable pulled and tested. 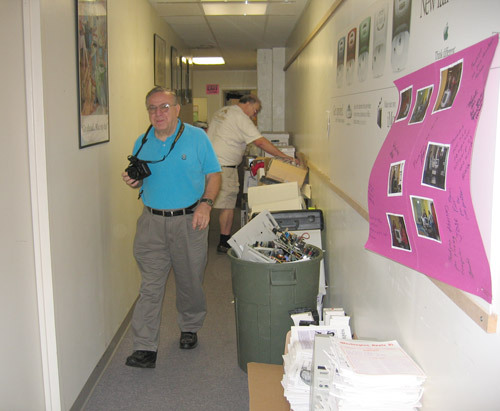 The Crew wanted to install cable junction boxes in the walls of the front office and main meeting room, but we couldn’t actually reach the walls because of piles of “stuff” being moved. 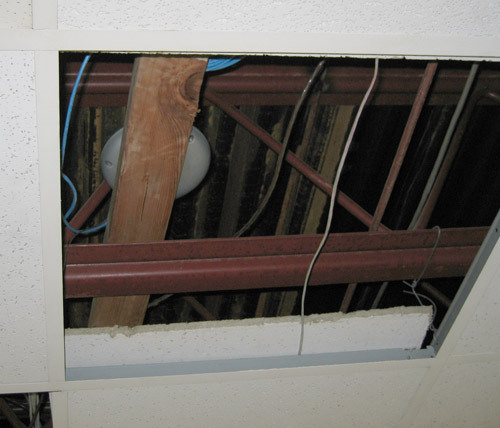 On October 15, 2005, the Crew returned, had pizza instead of Chinese, discussed several administrative items, and installed the junction boxes. The Age of LocalTalk finally passed away, given over completely to the Age of Ethernet and Airport.